For most people life is a "wait". Every day they wake up waiting for something, sometimes a job, getting married, next bonus, good food, next pair of jeans... The list goes on. What we dont realise is that Baba always said that the truth is now and with you. If you learn to appreciate what you have the wait will be over! "Pray, let go and then be ready to receive" - short, yet a powerful tool. If we can put this into practice our satguru Shirdi Sai will come and bless us with his love and care. Thank you Ma’am for the beautiful and thoughtprovoking quotes. Shirdi Sai Baba devotees , After all you can only ask for things and problems you are aware of .. Baba has to take care of circumstances and issues that you had no idea about. He is our protector and we should all learn to surrender to him. Shirdi SaiBaba devotees ,What is wanted is true faith in Baba's words and a perpetual contemplation on the indisputable assurances of the God of Shirdi, with love and patience. Wouldn't such a life be the true example for peace, contentment, and love, the true exuberance of Sai's grace? Shirdi SaiBaba devotees, For those who believe in Baba, patience and prayer will definitely be rewarded. Fasting controls passion. It checks the emotions. It controls the senses also. It is a great penance. It purifies the mind and the heart. It destroys a multitude of sins. Fasting controls the tongue in particular, which is the deadliest enemy of man. Fasting overhauls the respiratory, circulatory, digestive and urinary systems. It destroys all the impurities of the body and all sorts of poisons. It eliminates uric acid deposits. Just as impure gold is rendered pure by melting it in the crucible again and again, so also this impure mind is rendered purer by repeated fasting. The chief object of fasting is to render the system calm so that one is able to practice meditation rigorously during that period. During fasting, one should withdraw the senses and fix the mind on God. Pray to God to guide us and to throw a flood of light on our spiritual path. Say with feeling, "O God, guide me! Protect me, Protect me! I am yours, I am yours! Forsake me not!" We will be blessed with purity, light and strength. Fasting is one of the ten canons of YOGA. However, avoid excessive fasting. It will produce weakness. Fasting makes a man strong, both spiritually and mentally. Fasting is prescribed for the removal of the five capital sins. Fasting cures some diseases that are pronounced incurable by doctors. Occasionally, a complete fast is greatly desirable for all to keep up good health, to give adequate rest to the internal organs and maintain celibacy. All diseases have their origin in overeating and verily fasting is the only method to cure this. Complete Fasting helps to control sleep. One should avoid all company during fasting. Try to live alone and use that time in Sadhana. When breaking fast we should have light meal and easily digestible light food. Milk or some fruit juices are beneficial. Shirdi Sai Baba devotees When we really believe in Baba then every action we do has to reflect of his teachings. We have surrender every thought to him and then the difference between right and wrong will come on its own.. May Baba always guide us..
Shirdi Sai Baba devotees, Baba always said be kind to every one. Even if you dont want to give to someone always be nice to them. You never know in what form will Baba visit you today. Maybe the next beggar, your domestic help, you never know. Be prepared! 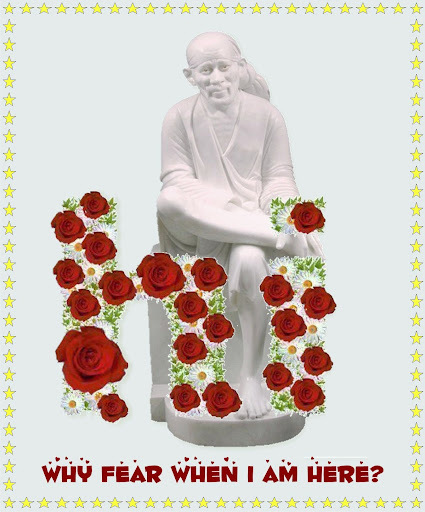 Shirdi Sai devotees, Baba gave the lesson of Faith and Patience not as mere words to be remembered once a while or read in books, but to continuously put them into practice. Though very easy to read and understand the dictionary meaning, they are the most difficult to practice in one's life. As one tries to practice these two qualities, they discover that the harder it gets to deal with them. At times it goes to such an extent that Baba's dictum seems more philosophical than practical. It is for this reason that Baba left a series of stories to serve as an example to inspire his followers. Fear is one of the qualities that could drive a person to the level of insanity. Fear manifests in different ways and forms and may lead to other vicissitudes such as anger, greed, lust, etc. Fear of the unknown is the biggest cause of misery. People make their lives miserable because of fear. Fear can be fought with Faith and Patience. to happen will go a long way to lessen the agony and pain that one harbors in their lives. Patience is merely not just waiting but also actively believing that God is with them and will help them against all odds. Keeping faith alive against all odds in prayer and experiencing all difficulties that may come is Patience. As Baba says, Faith and Patience are like twin sisters, one cannot live without the other. Where there is no faith there is no patience and vice versa. The difficulties that do come in our lives are a result of our own past actions and the results of those have to borne as explained by Baba in Satcharita. So there is no point in arguing why difficulties or unhappiness comes, it is a fact of life as any other fact. Dealing with it in the way prescribed by Baba is the key to burden and live it when sorrow knocks on the door. When one walks on the path laid by Baba it is invariably noted that slowly but surely the fear that was lurking behind slowly disappears and one starts becoming free of the burden and sing joyously in honor of the master who is ever ready to lead all those who approach Him. A lot of trouble would disappear in the world if people talk "To" one another..